From I-40 go south on 95 to Parker. Turn right on California Avenue. Proceed 1 mile, cross the bridge & turn right at Highway 62. Continue 10 miles. Echo Lodge Resort is on the right. If you are coming from Los Angeles. Take I-10 East to Desert Center (Hwy. 177); continue north on 177 until it becomes Hwy. 62. Remain on 62 and pass the Parker turnoff, staying on the California side of the river. Continue 10 miles. 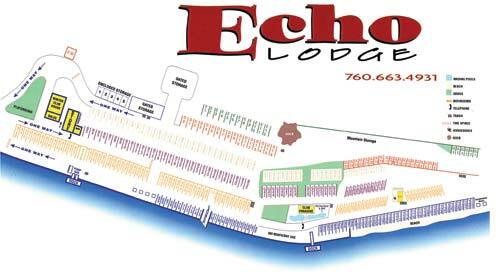 Echo Lodge Resort is on the right.